Sylvanian Families are, let’s admit it, NOT cheap. They are, however, worth every cent of their retail price as quality and craftsmanship are impeccable qualities of this toy line. 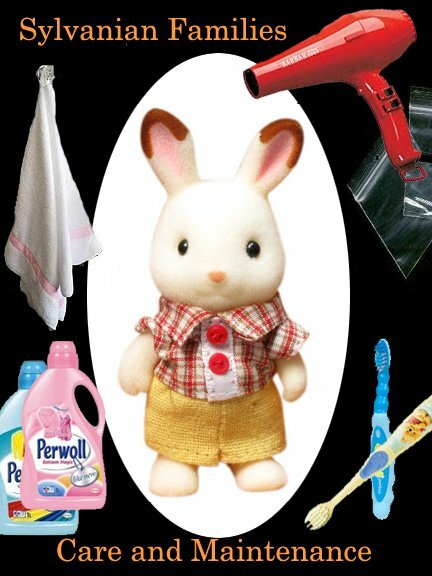 It’s important to take care of your Sylvanian Families. Cared for, even when played, they will last many years and they can be passed on to your children or their children.Here are some important collecting tips to ensure the longevity of your Sylvanian Families. Sylvanian Families come with a code at the bottom of the box. As you catalogue your toys, note the codes as well, as these can be helpful in tracking down missing pieces or for buying extras of your favorite things. Try to save your boxes. Boxes have value too and toys in boxes usually go higher, should you one day decide to sell them. This is one of the best tips I learned from a good friend, Eric, at the forum, which I will be passing on to you. As soon as you open a play set, take pictures of its contents so you know which belongs with what. Documenting all the small pieces will save you the headache of rummaging for the boxes should you misplace an item in the future. For those with smaller kids in the house, knowing how many pieces come with a set and knowing which pieces are those are especially important. This also saves a lot of time when it comes to segregating and organizing all the itty bitty stuff. Most of the time, your play sets will have stickers. Scan them first before use. That way, should you accidentally tear them, you can print a replacement using sticker paper. Although Sylvanians are sunny in disposition, they are actually better as nocturnal critters. Sylvanians in storage do better in darkness so keep them in a dry, darkened box or room. Use silica gel to prevent moisture buildup and mold growth. If you like to play with your Sylvanians, as I do, avoid direct sunlight as it will discolor figures, buildings, and accessories. Silica gel packets are useful in keeping your figures and furnitire safe from mold and mildew. Save and repurpose the ones from your old shoes, toys, and even food, or buy a box of silica gel dessicant packs from the hardware store. Store your toys by sets. Photographing sets before you use them helps you identify which set individual pieces come from. Furniture can be cleaned using a damp towel and some mild soap. Mild discoloration can still be remedied by wiping the furniture piece with a damp towel soaked in diluted (watered down) bleach. Older cases of discoloration will need repainting to cover up stains. To clean your figures, a soft toothbrush can be used to gently flick away dirt from the flocking. Do not brush vigorously as the action might rip the flocking. Magic tape, masking tape, and blu tac can also be gently pressed on the affected area to remove dirt. If the brush does not work, use a slightly damp face towel to pat the affected area. Try not to scrub as the towel might scuff the fur. Sylvanians are not averse to water. They can stand a little washing but don’t scrub, don’t use harsh detergents or strong chemicals, and don’t bleach unless they are all white. Mild baby shampoo works best; a mild detergent for delicate clothing (eg. Perwoll) can also be used. Lukewarm water works best. Use only the pads of yout fingers to rub soapy water in your critters. Be careful that your fingernails don’t accidentally scratch the fur. You can use liquid color-safe bleach diluted in water to take out musty odors. Lightly swish your figures in this solution or allow the figures to soak for a few minutes. Rinse with lukewarm water and let dry. Whether bathing or freezing them, don’t forget to remove their clothes. Wash them separately, making sure each piece of clothing is colorfast before they join the rest. As in normal laundry, separate the white pieces from colored clothes. To dry wet Sylvanians, you can use a blowdryer in low setting, an electric fan, or plain air drying (just make sure you’ve removed excess water so it doesn’t get waterlogged long). Softly pressing the figure between two soft towels also helps remove excess water from the figure. Even if the figures appear dry to touch, don’t store them inside plastic just yet. Keep them freestanding for a couple of days to ensure that no moisture is left inside of them. For figures with colors that have faded away, you can use fabric pens to recolor and restore them. Retouch by dabbing gently the tip of the pen, making sure that the area is not too saturated with color. Also, make sure the colored areas are dry to touch (test with a tissue paper to see if the color transfers; if it does, then it may need more time to dry). To store them, separate them from other figures as much as possible. Cloth dyes may also be used to change colors, but the risk of transferring these dyes to other figures is great. I’ll be adding more tips as I think of them so please keep coming back! If you have any tried-and-tested suggestions of your own, please feel free to leave a comment or two! I welcome your feedback! What you said absolutely right. Sylvanian Families not cheap toys but the price is comparable with the craftsmanship with impeccable quality. I remembered when I bought first time this Sylvanian families at https://www.tinkerbelltoys.nl/brands/sylvanian-families/ I confused which one I have to choose since all Sylvanian so cute and adorable. I bought Sylvanian families – Silk Cat families. On your blog I found how to care and cleaning of it. Something that I need. Thanks for sharing the tips. It helps to caring my Sylvanian. You may, but not for long, certainly not overnight or something like that. Newer figures may stand the water but old ones are fragile. As for the issue of discolouration, it’ll be hard to change them back to their original color without the risk of destroying their flocking. They can withstand being in water but not for very long, and washing them will involve a lot of care. Try using non chlorine bleach and soapy water, use the pads of your fingers to rub these on them, and rinse well. Don’t soak them long. If they are old, the flocking might come off. If the yellowing doesn’t lighten significantly, just think of it as part of their aging process. It’ll also make them unique! Great and very informative article! Thank you for sharing your tips! I find that the nose colours tend to fade after abit so I use watercoloured markers and qtips to gently dab the colour back into my figures! I also love the advice of using toothbrush to brush away the dust!